These traditional red tip tracer rounds are completely safe to shoot from any weapon chambered for 9mm Luger (9x19 Parabellum). Each round produces a bright red streak of light that can easily be seen day or night. 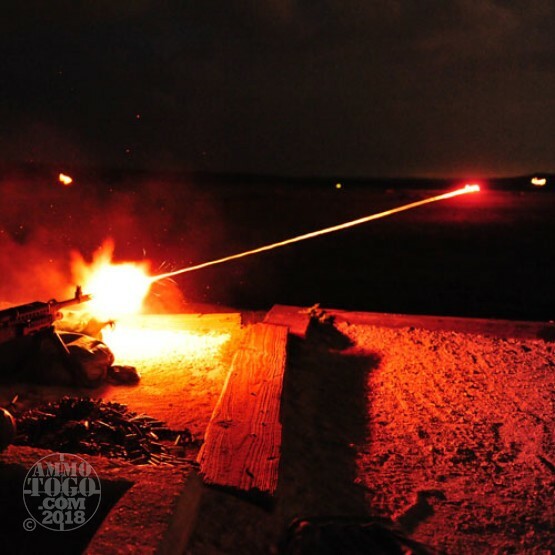 Originally developed as a military round for aiming assistance, these red tip tracers illuminate the trajectory of the bullet so the shooter can easily observe where rounds are hitting. Featuring a unique pyrotechnic charge at the base of each round, these loads produce a highly visible trail of light when the primer ignites the propellant powders. Tracing bright red upon exiting the muzzle, these rounds continue to trace for up to 400 yards. The bright red trail is especially visible at night, although the trace is still visible, even in bright daylight conditions. Entertaining as a novelty round, these loads produce hours of fun shooting. They do pose a mild fire hazard, so care should be used to avoid firing into dry brush or other combustible materials.